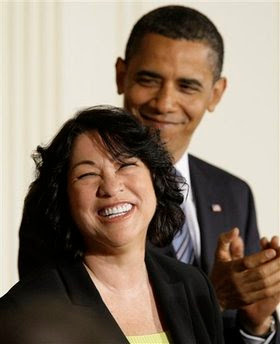 In announcing Judge Sotomayor's nomination to the Supreme Court, President Obama cited her ruling, while a federal district judge, which effectively lifted the 1994-95 baseball strike. But Judge Sotomayor has decided some cases involving football, as well: she sat on a panel of federal judges who decided a case brought by former Ohio State star Maurice Clarett, challenging the NFL's rule requiring players to wait three full seasons from the time they graduated high school before they could enter the draft. By 2004, Sotomayor had moved onto the U.S. Court of Appeals for the Second District [*] when she ruled on a case involving the NFL's age minimum. Maurice Clarett, a star running back at Ohio State, and Mike Williams [**], a wide receiver from USC, had sued to be allowed into the NFL Draft before they had been out of high school for three years, as mandated by the NFL's rules. A lower court had ruled that the age-limit should be overturned, but the appeals court granted the league's request for a stay of the ruling [***]. During the hearing [****], Sotomayor asked Clarett's attorney, Alan Millstein, why players who were already a part of the NFL Players' Association should risk losing their jobs to non-members. "Those 1,500 players want to protect themselves," she said. "That's what unions do: protect those in the union from those not in the union." The NFL age-minimum remains in place. (H/t Dr Saturday.) I have added asterisks where there are errors or at least questionable statements of fact. * - First, it is not the "Second District," it is the US Court of Appeals for the Second Circuit. A google search turns up the Wikipedia page and the Federal Judiciary's website. That might seem a trifling error, but (a) Sports Illustrated is supposed to be comprised of actual journalism, and (b) had they said Maurice Clarett played for Michigan, or played for the Ohio University Wolverines, sports fans would be up in arms. Details matter. ** - Second, Mike Williams was not a party to the case; indeed, he did not declare for the draft until much after Clarett. The confusion I suppose stems from the fact that Williams and his agent jumped the gun. Clarett initially won his ruling at the district court, only to be unanimously overturned on appeal before Sotomayor and the two other judges (one, another appellate judge like Sotomayor, and the other a district court judge sitting on the case by designation). Williams quit school at Southern Cal midway through a semester in reliance on the first Clarett ruling, and after that decision was overturned he had committed too many NCAA infractions to return. But to imply that Sotomayor and the Second Circuit had before her Williams's case is inaccurate. Again, details matter. **** - This is a minor point and, if not for the others, would have gone unmentioned. But appellate courts -- at least federal ones -- don't have "hearings," they have "oral arguments." A hearing implies witnesses, evidence, and all that good Law & Order stuff. Appellate courts are simply conversations between lawyers and judges about the legal principles; the only facts are what is contained in the record. This is less a sin than the first three (which were all flatly false -- an amazing quantity of false statements in such a short paragraph), but it is worth getting the terminology right. Finally, the larger point is how the article ends. It somehow implies that the decision was made at the "hearing," off of this one out of context and kind of vague statement that labor unions are important, which is meaningless in the context of the SI piece since it failed to explain what the case was about at all. Clarett's attorney, Alan Milstein, argued keeping Clarett out of the NFL would unreasonably restrict his client's earnings. Of course it would restrict his earnings, because it would keep him out of the NFL for another year. But the question for the three-judge panel was whether this was unreasonable or unfair. (H/t Deadspin.) Maybe I'm being "unreasonable or unfair," but I can't help but assume that Peter King failed civics. That's not the kind of question federal judges are asked to answer. He should know this. So what was the question before the Sotomayor and the other two judges on her panel? Broadly, Clarett argued that the NFL was unlawfully keeping him out of the league -- i.e. restricting his ability to ply his trade of being a football player -- in violation of the federal anti-trust laws. The NFL argued that the federal anti-trust laws didn't apply because another set of laws, federal labor law, preempts or basically knocks the anti-trust law out from applying. Federal labor law governs companies who have entered into collective bargaining agreements with unions, which of course includes the NFL which has an agreement with the NFL Players union. Many politicians like to ask of potential Supreme Court Justices: "Will they simply apply the law, or will they impose their own views?" Well, in this case, the actual question was not about whether to apply the law (nothing is ever as simple as the slogans make them appear to be), but rather: what law applies? Somewhat complicating matters is that Sotomayor, who wrote the opinion in Clarett v. NFL, had to look both at what the laws Congress passed in the anti-trust and labor contexts said, but also what the Supreme Court has said as it had tried to reconcile these cases. Specifically, the Supreme Court had recognized certain "exemptions" where anti-trust did not apply because certain labor law provisions already governed. (A common thing -- unions restrict trade to favor employees, which anti-trust is designed to prevent restraints on trade; regardless of your views of it, Congress has for over a century legislated in these areas and that legislation embodies a balance between these interests.) But the Clarett case was so difficult because the Supreme Court had identified a "non-statutory exemption" to anti-trust law but had not completely delineated its contours. Clarett, former running back for Ohio State University and Big Ten Freshman of the Year, is an accomplished and talented amateur football player. After gaining national attention as a high school player, Clarett became the first college freshman since 1943 to open as a starter at the position of running back for OSU. He led that team through an undefeated season, even scoring the winning touchdown in a double-overtime victory in the 2003 Fiesta Bowl to claim the national championship. Prior to the start of his second college season, however, Clarett was suspended from college play by OSU for reasons widely reported but not relevant here. [Citing Mike Freeman, Buckeyes Suspend Clarett For Year, N.Y. Times, Sept. 11, 2003, at D1.] Forced to sit out his entire sophomore season, Clarett is now interested in turning professional by entering the NFL draft. Clarett is precluded from so doing, however, under the NFL's current rules governing draft eligibility. Founded in 1920, the NFL today is comprised of 32 member clubs and is by far the most successful professional football league in North America. Because of the League's fiscal success and tremendous public following, a career as an NFL player "represents an unparalleled opportunity for an aspiring football player in terms of salary, publicity, endorsement opportunities, and level of competition." But since 1925, when Harold "Red" Grange provoked controversy by leaving college to join the Chicago Bears, the NFL has required aspiring professional football players to wait a sufficient period of time after graduating high school to accommodate and encourage college attendance before entering the NFL draft. For much of the League's history, therefore, a player, irrespective of whether he actually attended college or not, was barred from entering the draft until he was at least four football seasons removed from high school. The eligibility rules were relaxed in 1990, however, to permit a player to enter the draft three full seasons after that player's high school graduation. Clarett "graduated high school on December 11, 2001, two-thirds of the way through the 2001 NFL season" and is a season shy of the three necessary to qualify under the draft's eligibility rules. Unwilling to forego the prospect of a year of lucrative professional play or run the risk of a career-compromising injury were his entry into the draft delayed until next year, Clarett filed this suit alleging that the NFL's draft eligibility rules are an unreasonable restraint of trade in violation of Section 1 of the Sherman Act, 15 U.S.C. § 1, and Section 4 of the Clayton Act, 15 U.S.C. § 15. Judge Sotomayor then recounted the history of the NFL and the players' union's collective bargaining agreement, including changes through history. Ultimately, she reached her framing of the question (which, uh, differed from what Peter King thought the case was about). Clarett argues that the NFL clubs are horizontal competitors for the labor of professional football players and thus may not agree that a player will be hired only after three full football seasons have elapsed following that player's high school graduation. That characterization, however, neglects that the labor market for NFL players is organized around a collective bargaining relationship that is provided for and promoted by federal labor law, and that the NFL clubs, as a multi-employer bargaining unit, can act jointly in setting the terms and conditions of players' employment and the rules of the sport without risking antitrust liability. For those reasons, the NFL argues that federal labor law favoring and governing the collective bargaining process precludes the application of the antitrust laws to its eligibility rules. We agree. Although "[t]he interaction of the [antitrust laws] and federal labor legislation is an area of law marked more by controversy than by clarity," it has long been recognized that in order to accommodate the collective bargaining process, certain concerted activity among and between labor and employers must be held to be beyond the reach of the antitrust laws. Courts, therefore, have carved out two categories of labor exemptions to the antitrust laws: the so-called statutory and non-statutory exemptions. We deal here only with the non-statutory exemption. The Supreme Court has never delineated the precise boundaries of the exemption, and what guidance it has given as to its application has come mostly in cases in which agreements between an employer and a labor union were alleged to have injured or eliminated a competitor in the employer's business or product market. In the face of such allegations, the Court has largely permitted antitrust scrutiny in spite of any resulting detriment to the labor policies favoring collective bargaining. Again, this is the classic federal appellate case, for which football, Maurice Clarett, the NFL, and all that merely fade into backdrop, as legal concepts intersect in strange and sometimes surprising ways. It's not that they disappear, it is that it is no longer about Big-Time-Football-Star and the National Football League, but a person who would like to ply his trade whereas an employer owes duties to its existing employees that the law protects. How does this play out? Labor law protects a union and employer's ability to restrict some entry of new workers; anti-trust law otherwise applies to prevent any restraints on trade. Congress has made many moves to shift this balance throughout, and courts struggle to keep up. In the next paragraphs, note the shout out to Justice White, who knew a bit about the NFL himself.
. . . .Contending that these cases establish the applicable boundaries of the non-statutory exemption to be applied in the present case, Clarett argues that the NFL's eligibility rules lack all of the characteristics that led Justice White to apply the exemption in Jewel Tea. Clarett, furthermore, maintains that the boundaries of the exemption were properly identified in, and thus we should follow, the Eighth Circuit's decision in Mackey v. National Football League. Mackey involved a challenge brought by NFL players to the League's so-called "Rozelle Rule," which required NFL clubs to compensate any club from which they hired away a player whose contract had expired. . . .
Relying on Mackey, the [lower court which had held for Clarett] below held that the non-statutory exemption provides no protection to the NFL's draft eligibility rules, because the eligibility rules fail to satisfy any of the three Mackey factors. Specifically, the district court found that the rules exclude strangers to the bargaining relationship from entering the draft, do not concern wages, hours or working conditions of current NFL players, and were not the product of bona fide arm's-length negotiations during the process that culminated in the current collective bargaining agreement. We [i.e. the Second Circuit Court of Appeals as a whole], however, have never regarded the Eighth Circuit's test in Mackey as defining the appropriate limits of the non-statutory exemption. Moreover, we disagree with the Eighth Circuit's assumption in Mackey that the Supreme Court's decisions in Connell, Jewel Tea, Pennington, and Allen Bradley dictate the appropriate boundaries of the non-statutory exemption for cases in which the only alleged anticompetitive effect of the challenged restraint is on a labor market organized around a collective bargaining relationship. Indeed, we have previously recognized that these decisions are of limited assistance in determining whether an athlete can challenge restraints on the market for professional sports players imposed through a collective bargaining process, because all "involved injuries to employers who asserted that they were being excluded from competition in the product market." Clarett does not contend that the NFL's draft eligibility rules work to the disadvantage of the NFL's competitors in the market for professional football or in some manner protect the NFL's dominance in that market. He challenges the eligibility rules only on the ground that they are an unreasonable restraint upon the market for players' services. . . . [O]ur cases have counseled a decidedly different approach where, as here, the plaintiff complains of a restraint upon a unionized labor market characterized by a collective bargaining relationship with a multi-employer bargaining unit. Moreover, as the discussion below makes clear, the suggestion that the Mackey factors provide the proper guideposts in this case simply does not comport with the Supreme Court's most recent treatment of the non-statutory labor exemption in Brown v. Pro Football, Inc..
Whew. And this is really just lead-in: the opinion goes on for several more pages, exhaustively recounting the various Supreme Court and lower federal court cases that bear on the issue. It ultimately comes together though, as Sotomayor and her colleagues conclude that the non-statutory exemption under labor law is broad enough, per the Supreme Court's dictates, to bar Clarett's challenge brought under the federal anti-trust laws. Clarett would have us hold that by reaching this arrangement rather than fixing the eligibility rules in the text of the collective bargaining agreement or in failing to wrangle over the eligibility rules at the bargaining table, the NFL left itself open to antitrust liability. Such a holding, however, would completely contradict prior decisions recognizing that the labor law policies that warrant withholding antitrust scrutiny are not limited to protecting only terms contained in collective bargaining agreements. The reach of those policies, rather, extends as far as is necessary to ensure the successful operation of the collective bargaining process and to safeguard the "unique bundle of compromises" reached by the NFL and the players union as a means of settling their differences. It would disregard those policies completely to hold that some "particular quid pro quo must be proven to avoid antitrust liability," or to allow Clarett to undo what we assume the NFL and its players union regarded as the most appropriate or expedient means of settling their differences, id. at 961. We have cautioned before that "[t]o the extent that courts prohibit particular solutions for particular problems, they reduce the number and quality of compromises available to unions and employers for resolving their differences." Clarett would have us disregard our own good advice. And so Sotomayor moved on to the next case, Clarett now sits in jail, Mike Williams is god knows where, and the NBA wound up following the NFL's lead and imposing its own eligibility rule. Life moves on. Bear Bryant: spread offense innovator?